Built on the site of the former DCNR offices at the corner of Charles Street and East Central Avenue, the RiverWalk Center is located next to the starting point of South Williamsport’s Riverwalk trail. The building was renovated/constructed by STEP’s Housing and Building team, which found ways to incorporate brick and wood materials from the old building into the new one. The RiverWalk Center is STEP’s newest center for healthy aging. Activities focus on wellness, socialization, and nutrition. Social and recreational activities include card parties, art classes, crafts, holiday festivities, square dancing (with live music! ), wood carving, computers with internet access, picnics, and more. Wellness programs include Healthy Steps in Motion, Tai Chi, and Zumba Gold. All of these programs are geared toward older adults, with a focus on providing benefits such as building strength and flexibility, and improving balance, allowing participants to have a better quality of life. Additional programs will take advantage of the center’s proximity to the Riverwalk and the South Williamsport Park Complex. Healthy Aging through Local Harvest is STEP’s series of cooking classes aimed at helping older adults gain the knowledge to choose, prepare, and enjoy foods that are as fresh, healthy, and local as possible. Held weekly at the RiverWalk Center, the classes are free but registration is required – call the RiverWalk Center for more information! The RiverWalk Center also offers congregate meals. Prepared daily and incorporating locally sourced ingredients when possible, these hot meals are served Monday through Friday. Reservations can be made by calling the RiverWalk Center at (570) 601-9592. Reservations are required 24 hours in advance, and donations are welcome. 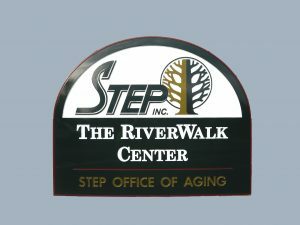 The RiverWalk Center is operated by STEP’s Office of Aging, a part of STEP’s Independent Living Pathway to Success.